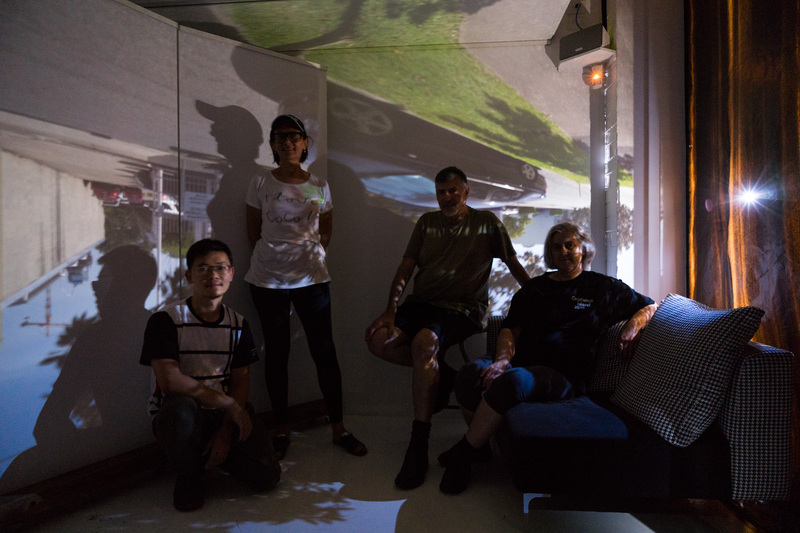 As a final event for Maud’s Festival of the Darkroom on November 26 between 12.00 Noon and 4.00pm we worked with Louis Lim to convert the Maud Gallery front room into a public Camera Obscura. 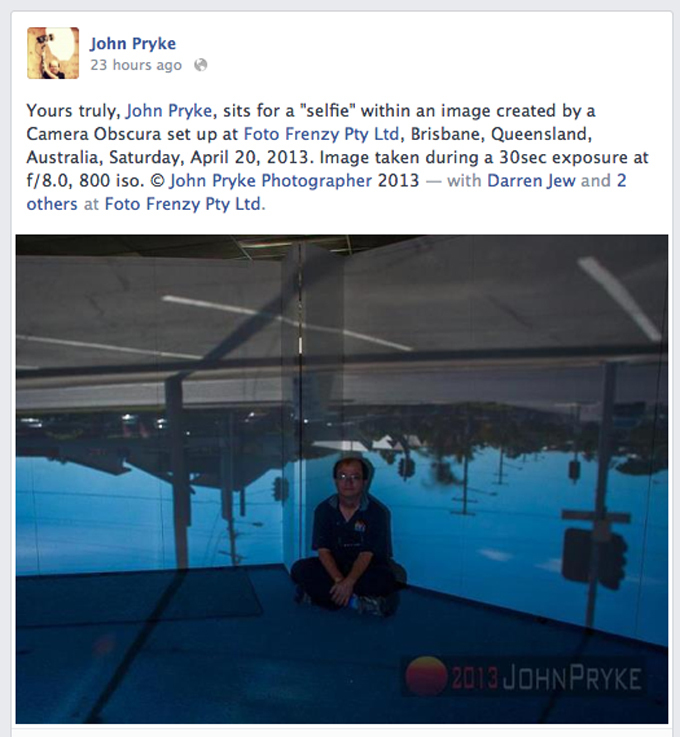 We invited members of the Brisbane photo community to join with us for a look back to the origins of photography. In our collaborative work, we are interested in both the physical construct and cultural conventions that inform and shape us. This includes the common rituals and structures that surround, support and transport us in our everyday lives. 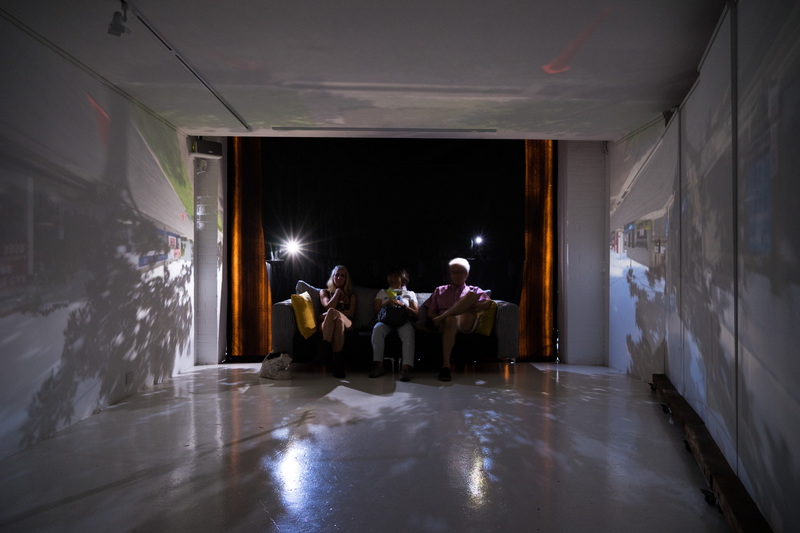 In this work we have extended the context of documentary photographic methodology to include the narrative potential of the camera obscura and architectural projections. 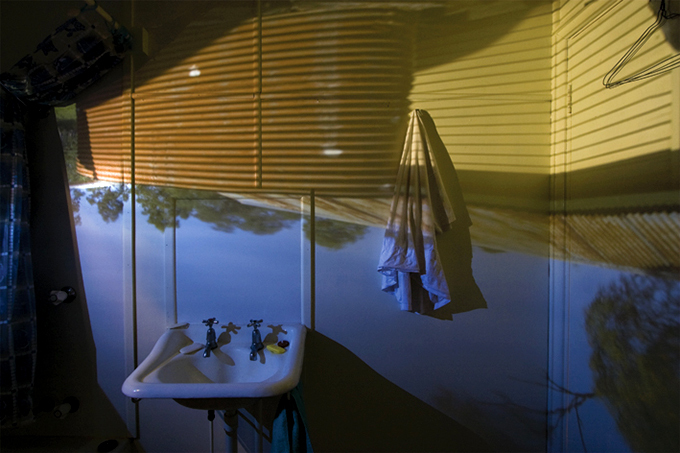 In the camera obscura work the viewer’s perception of the everyday is spatially challenged. 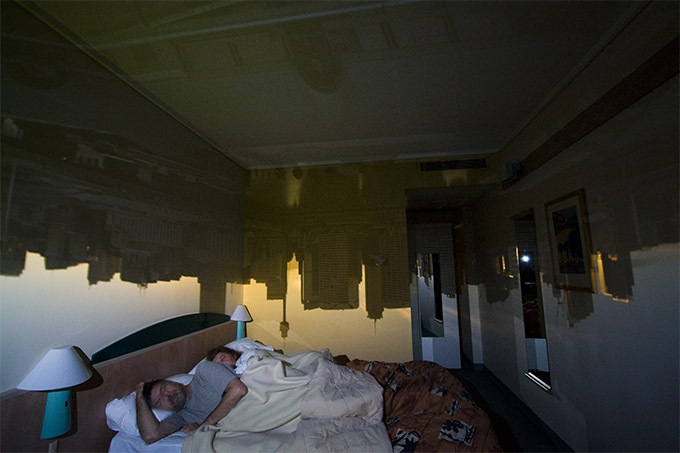 The structures that can form camera obscura are everywhere, but some spaces present themselves as clearly suitable for the making. 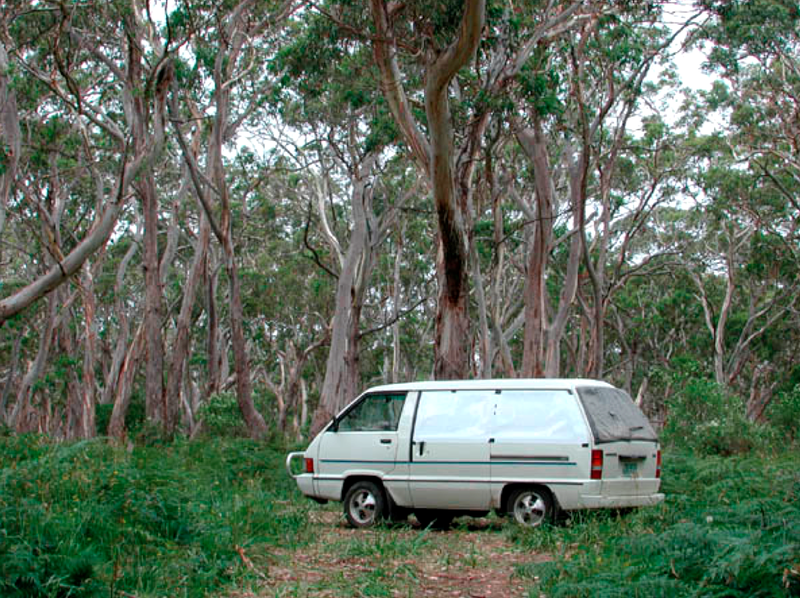 This could be a city office, a motel room, a country bathroom or even a car. 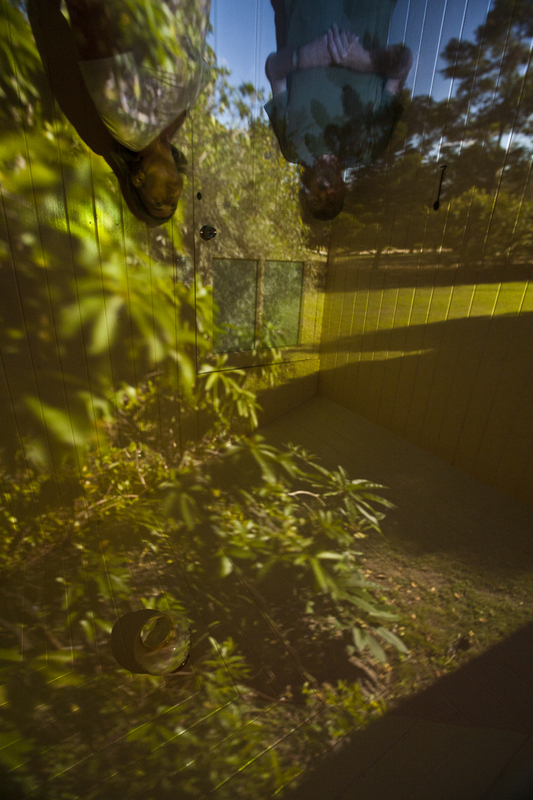 Our work attempts to contextualize the experience of the camera obscura within a concept, space or site. 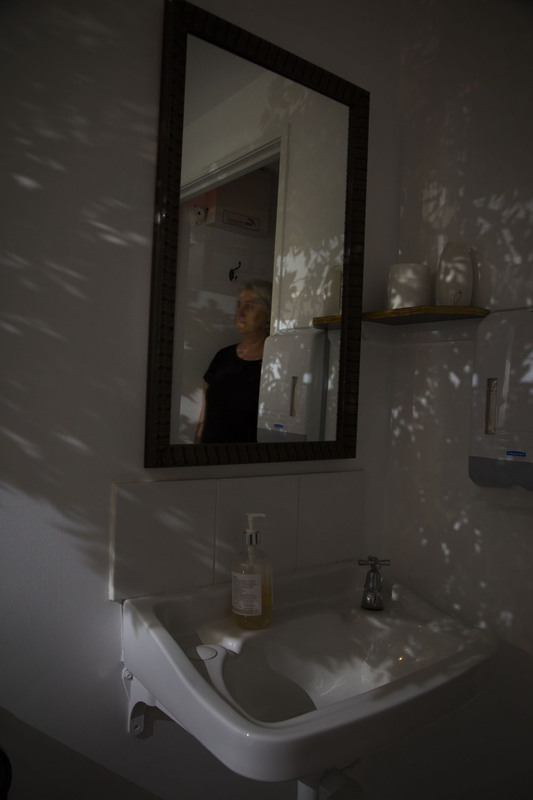 Upon entering the darkened space, the viewer is initially displaced, as the familiar image of the everyday is dim and unrecognizable. 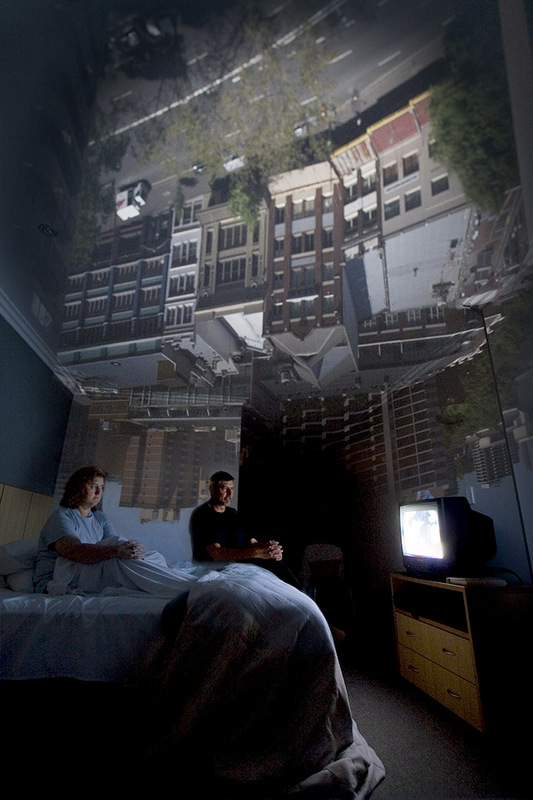 Then after time spent in the camera obscura, the image becomes clearer and the familiar is re-established ultimately resulting in a relocation of the observer’s awareness of place. Simple black garbage bags and some black electrical tape from the local 711 store. 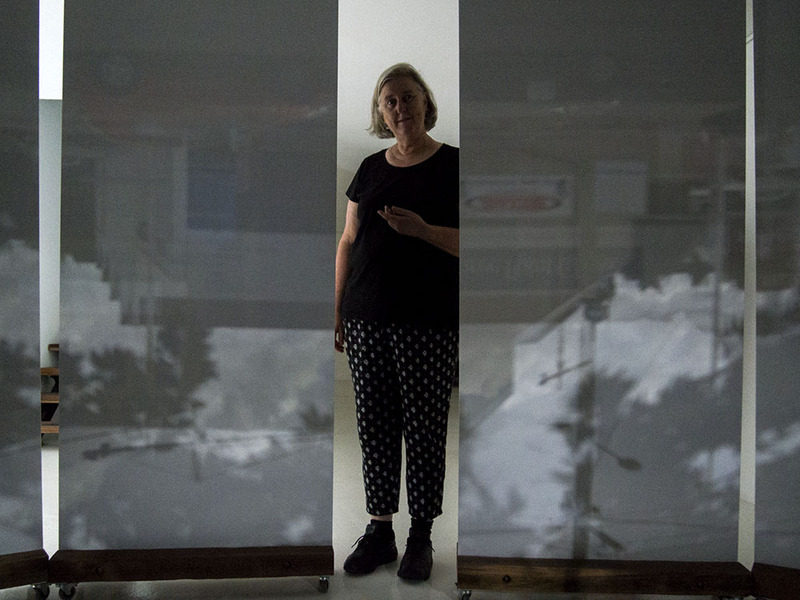 An aperture cut from a ‘found’ piece of aluminium – size around 8mm … we don’t use sophisticated glass lenses – these are direct light projections. 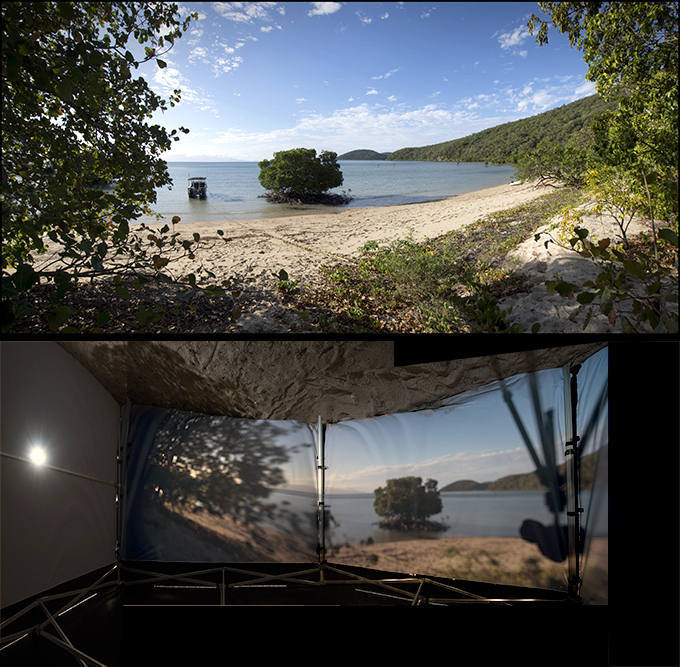 A digital camera bares witness to our experience by capturing the image of the camera obscura projection. 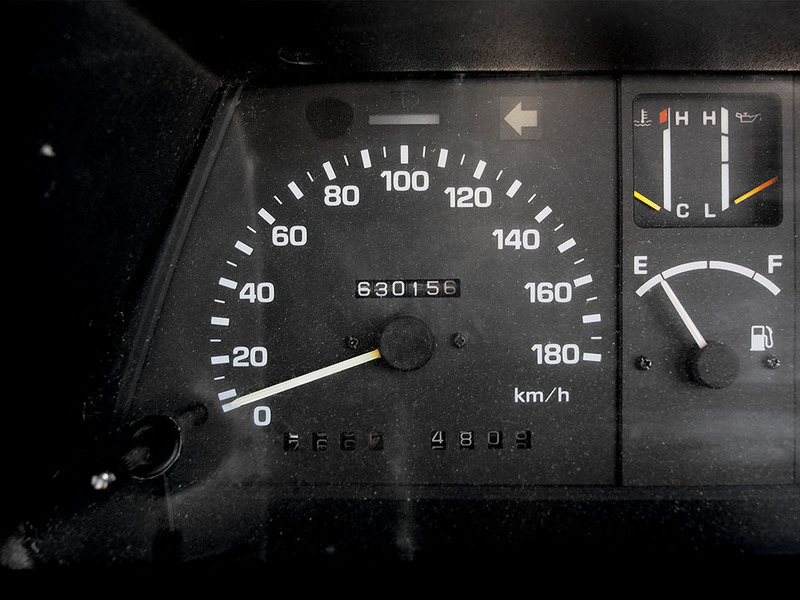 It was a smooth car/van in 1986 even though it was a 1985 model. in a book resting on the steering wheel!!!! 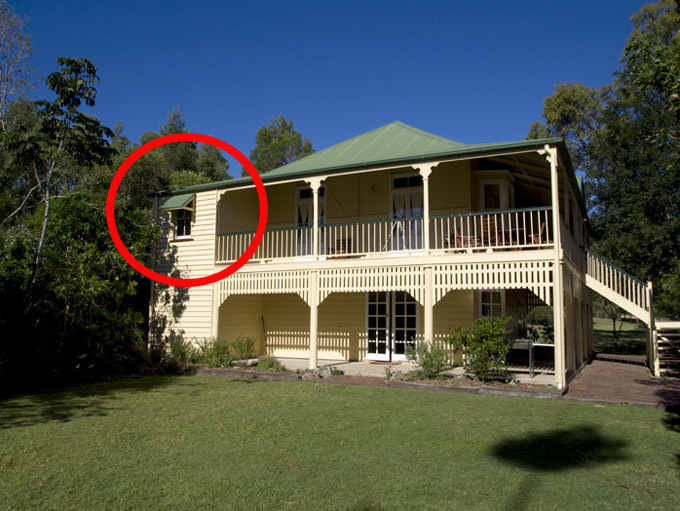 was it inside or outside – not sure where that ended up? 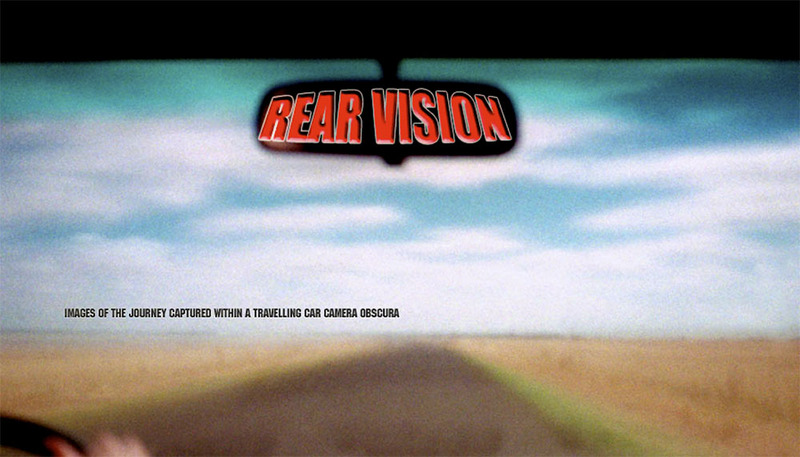 There were the breakdowns… we all have so why not CarCamera Obscura Tarago? 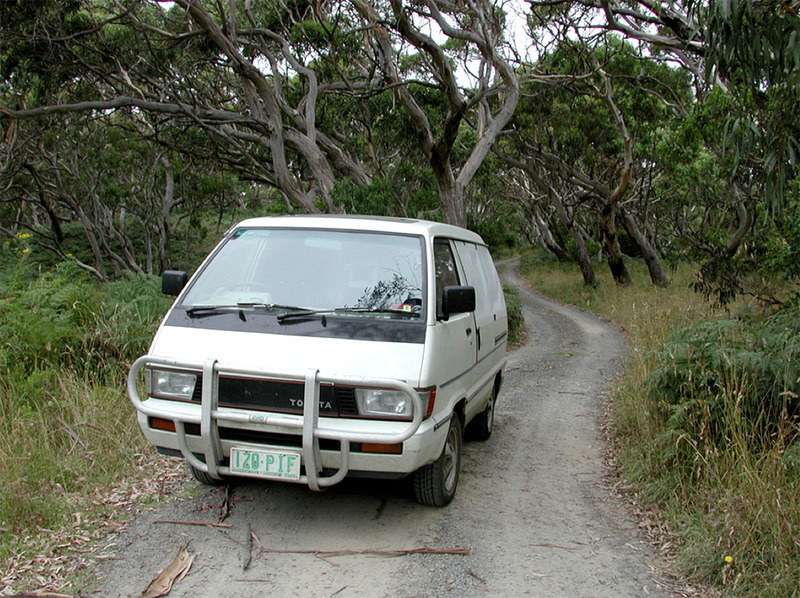 the journey for our Tarago was to end…. 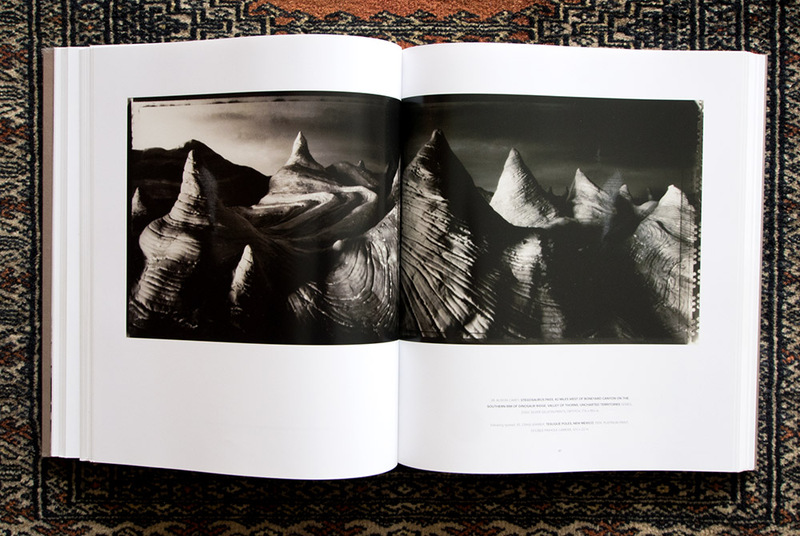 It’s not everyday that you wander into an art gallery bookshop and you stumble across a book with your work in it…! 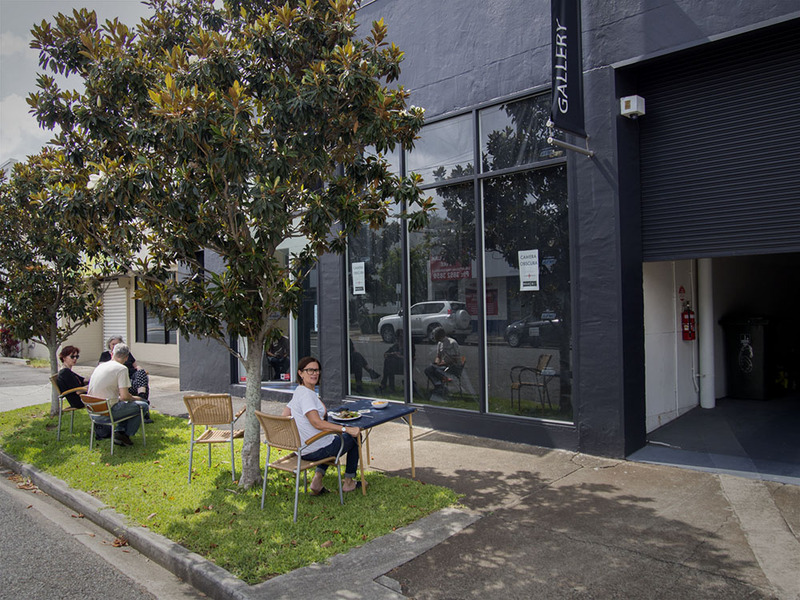 A favourite gallery bookshop for me is the QAGOMA bookshops in Brisbane – it’s always worth spending a little time there to see the latest books, to do a little in-store pre-reading, and to check out the ‘Specials’ table where the unaffordable book often becomes affordable. 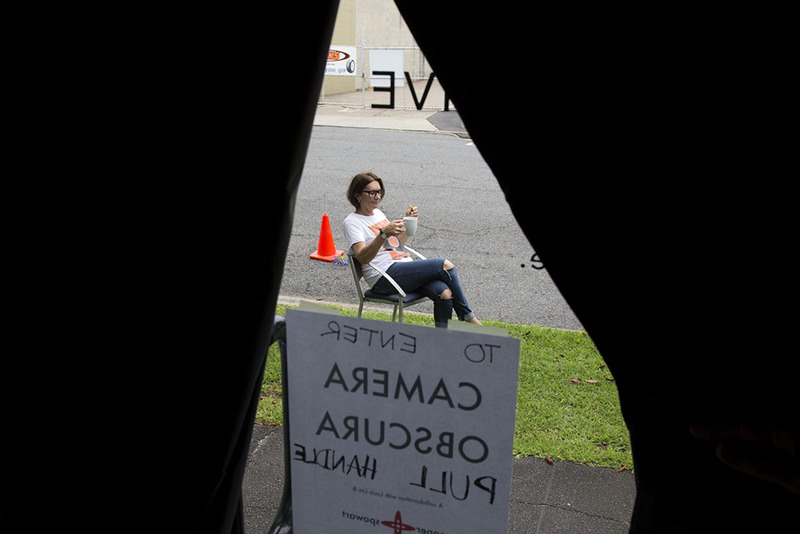 The other day I’d escaped from some research work at the State Library of Queensland by walking through the preparations in QAGOMA for the 8th Asia Pacific Triennial to drop by the gallery bookshop. 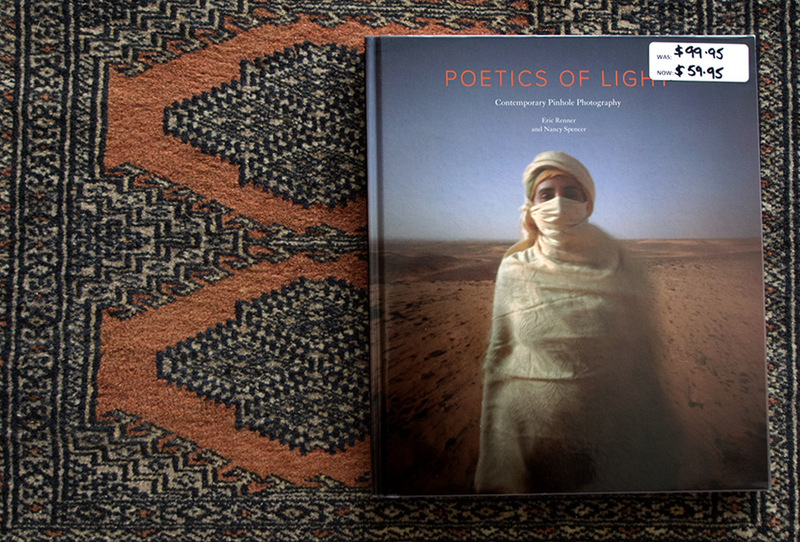 I held and flicked through a few books when a large volume entitled Poetics of Light with a big white reduced price label – $99.95 to $59.95. 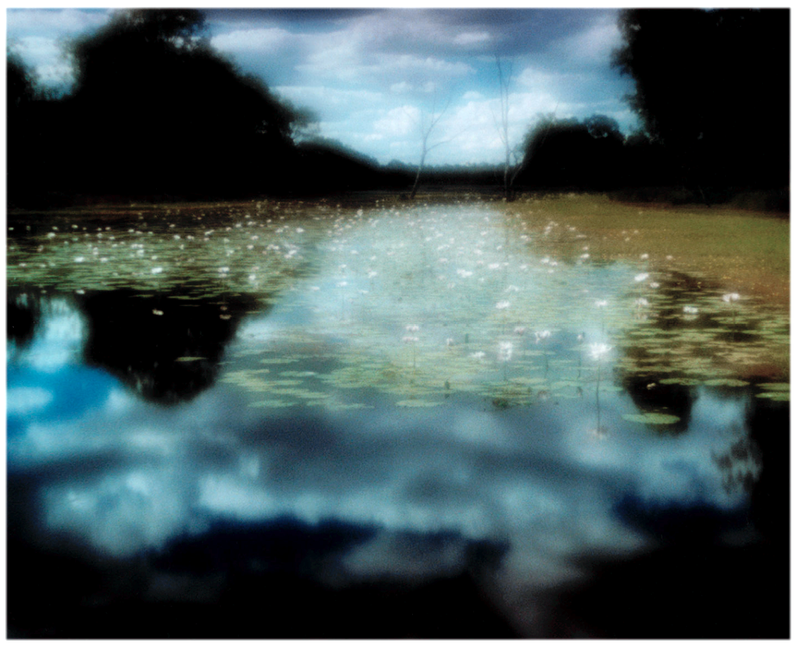 The title seemed familiar to me – then I saw the sub-title Contemporary Pinhole Photography, ‘yes, I remember that’, I thought to myself. The last couple of years for us have been full of life-changing experiences and dealing with the issues of the moment, my being made redundant at TAFE and the subsequent time spent job searching, selling our house, lecture and writing commitments and amazing house-sit opportunities for friends – I’d completely lost track of this book and the exhibition that it compliments. 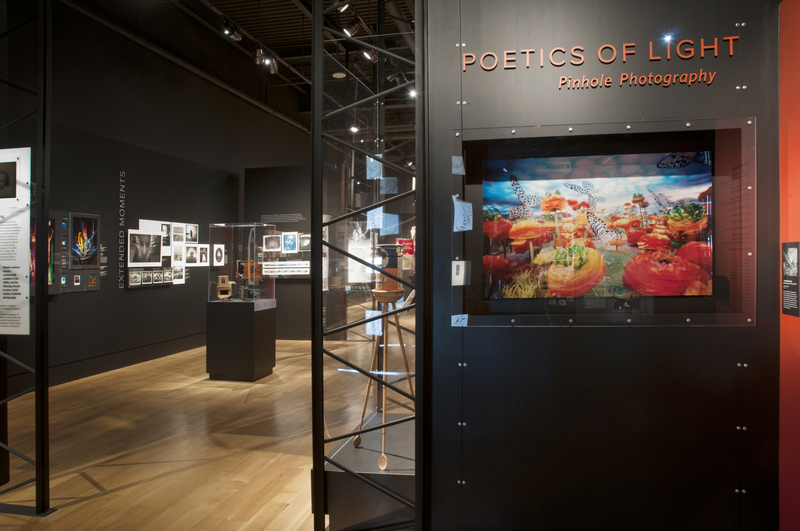 The Poetics of Life exhibition and book celebrates the donation of the pre-eminent Pinhole Resource Collection to the New Mexico History Museum (NMHM). 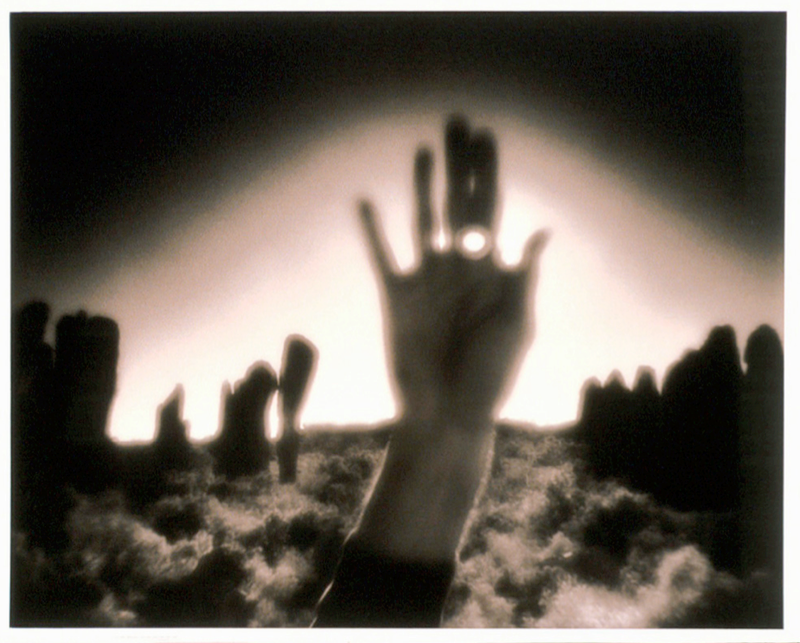 The Pinhole Resource was founded by Eric Renner in 1984 and became the world’s centre for all things pinhole. 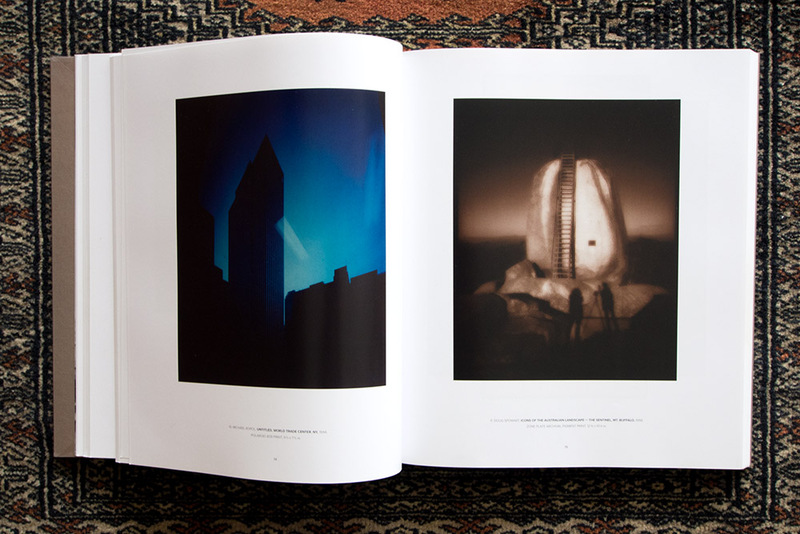 Through personal research, workshops, networking and publishing Renner led the resurgence in pinhole photography, its techniques, images and its discourse. 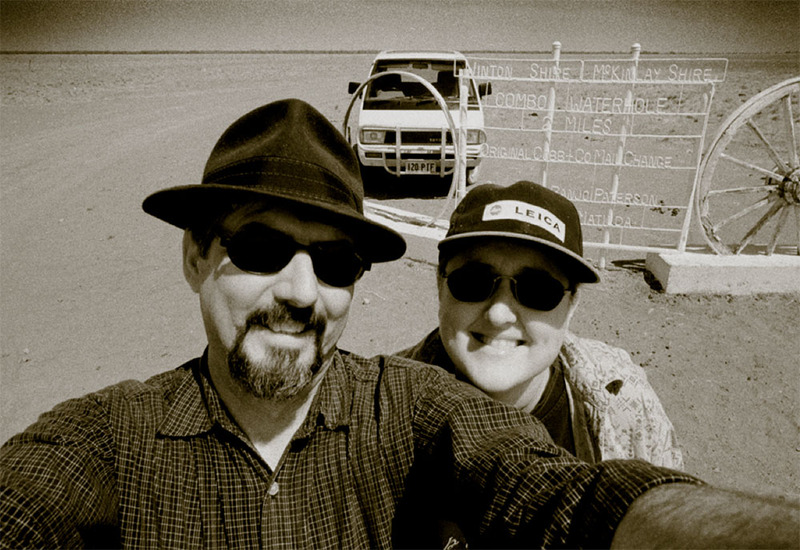 In 1989 Renner was joined by Nancy Spencer as a co-director of Pinhole Resource and co-editor of the Pinhole Resource journal. 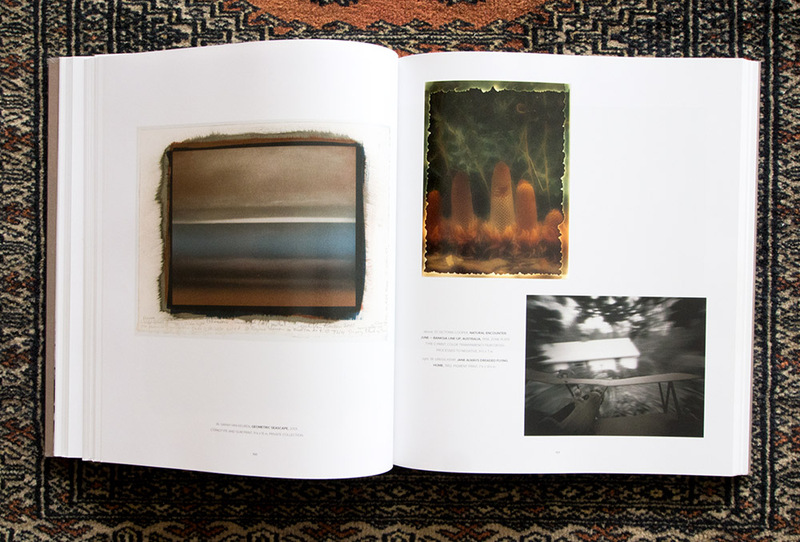 Over the years Renner and Spencer amassed a unique collection of pinhole and camera obscura images, cameras both old and contemporary and texts, books and references about the art and practice of pinhole photography. Much of this material was donated by practitioners as a way of contributing to the ‘Resource’. 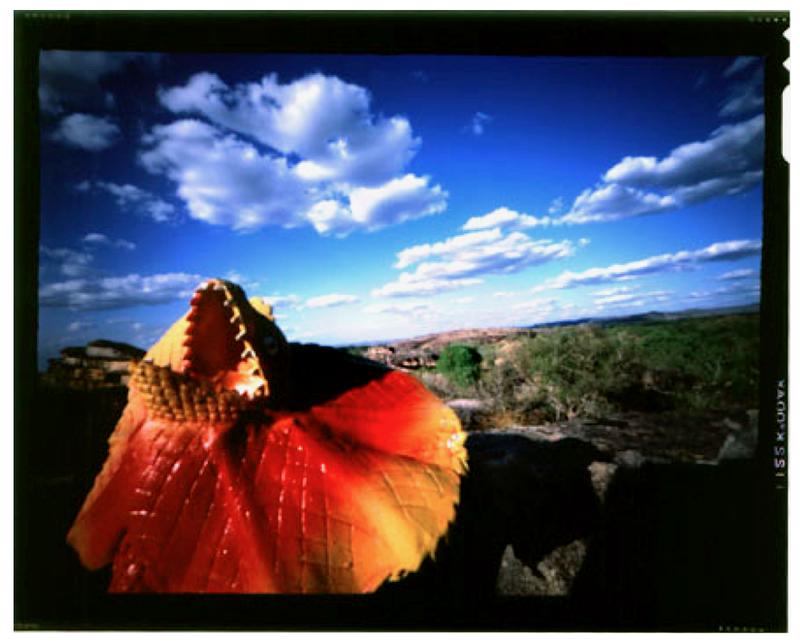 The Pinhole Resource Collection became part of the permanent collection of the Photo Archives of the New Mexico History Museum in 2012. 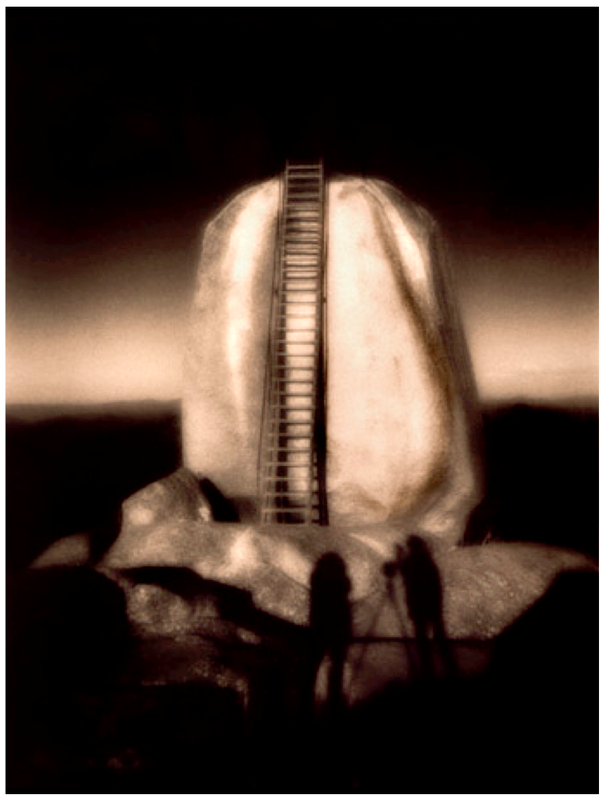 This research archive is has the largest collection of pinhole photography and paraphernalia in the world with over 6,000 photographs, cameras, documents and books, as well as an entire run of Pinhole Journal. The NMHM has a website with images available to be searched by author’s/artist’s name, and also includes education resources and a blog. We both felt privileged to have been selected for this book and exhibition and felt excitement at the opportunity to be recognised for our long practice in this worldwide movement. 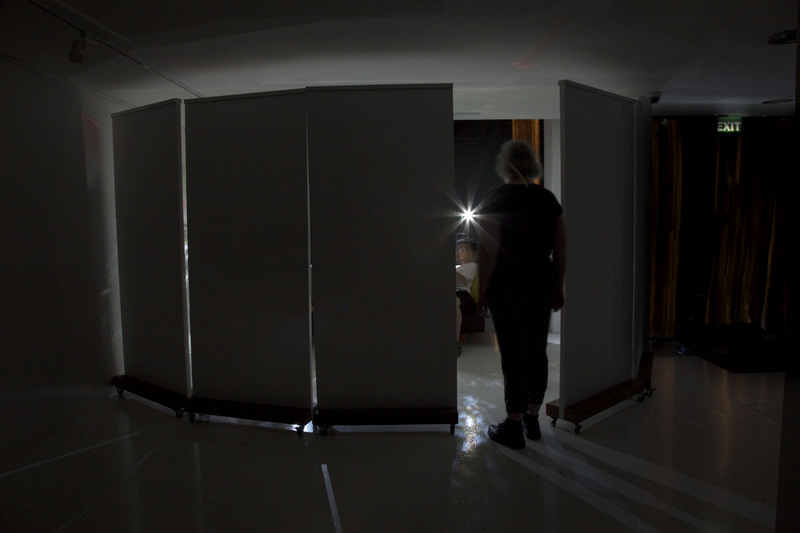 Whilst much of our contemporary work centres on the camera obscura each year we participate in the yearly World Pinhole Day in late April – SEE our 2015-submission post HERE. 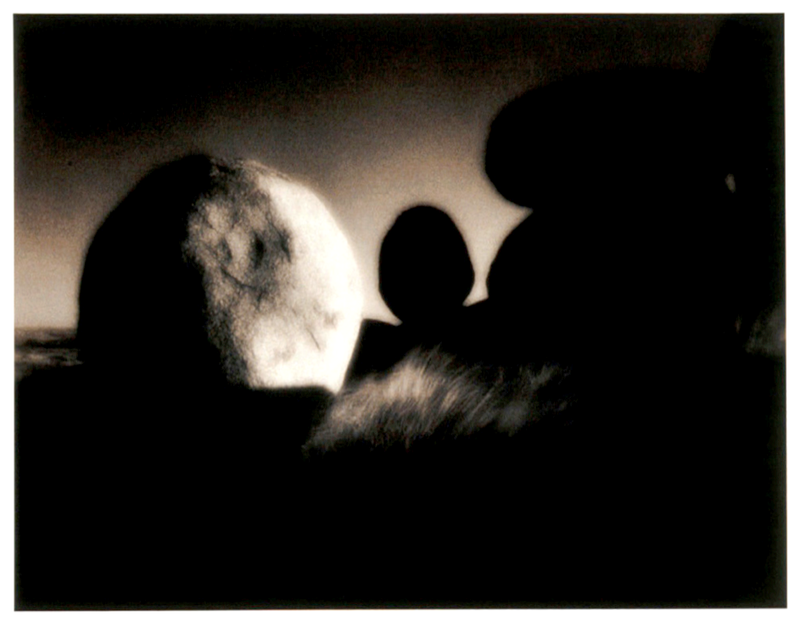 In a statement about the body of work, The Rocks of Ages, Victoria Cooper discusses her view that image is a result of the connection of technology, process, photographer and subject in the space/time of pinhole photography. 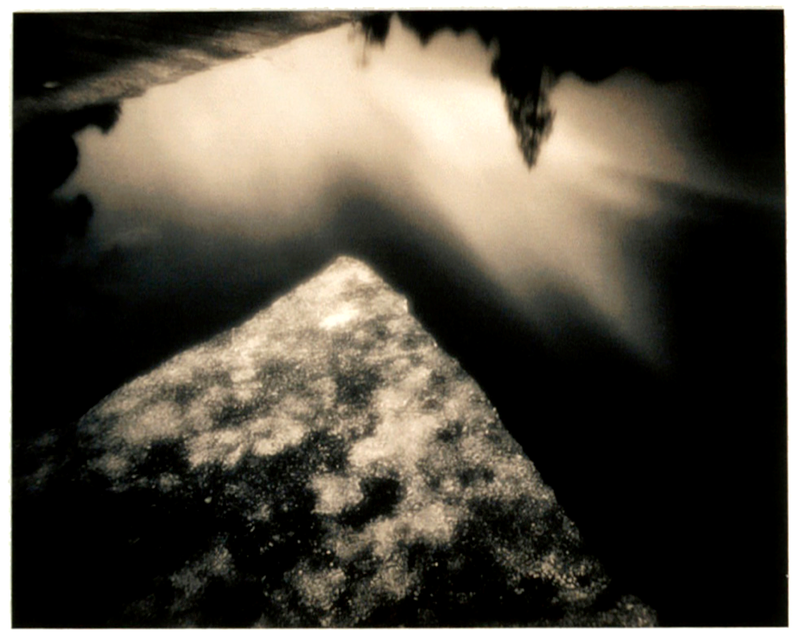 A pinhole digital photo made with a Fuji S1 Pro camera in late 2000. Henri Levebvre, Rhythmanalysis; Space, Time and Everday Life, page 82. 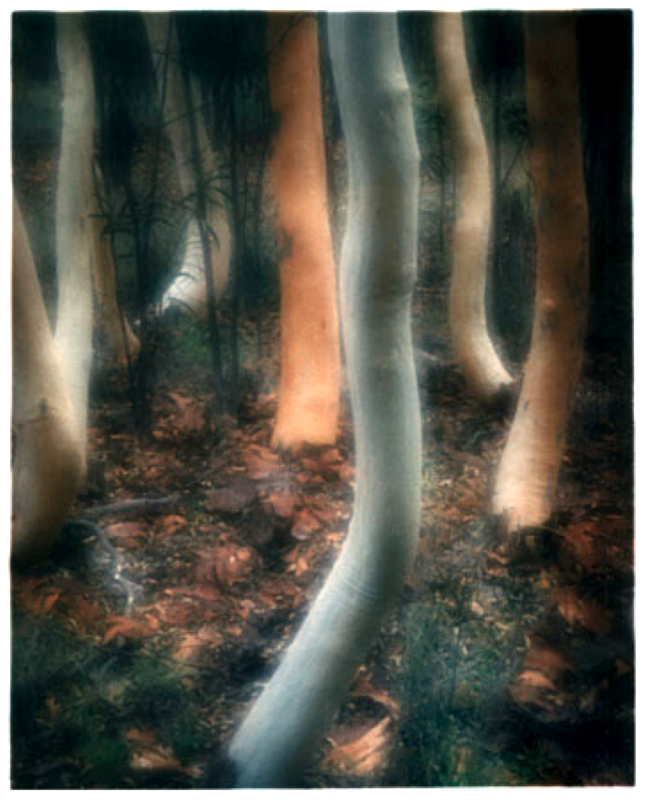 We were working with Darren Jew on a Foto Frenzy ‘Exploring Photography’ workshop @ Mt Barney Lodge, a bushland retreat in South-East Queensland’s World Listed Scenic Rim. 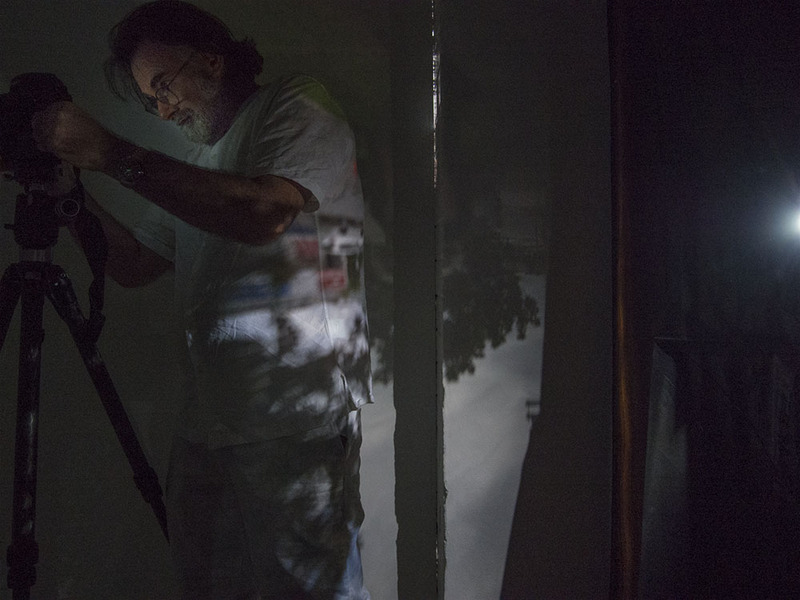 We briefed workshop participants on pinhole photography and helped them make pinholes for their DSLR cameras, and everyone joined in the activity of ‘pinholing’. 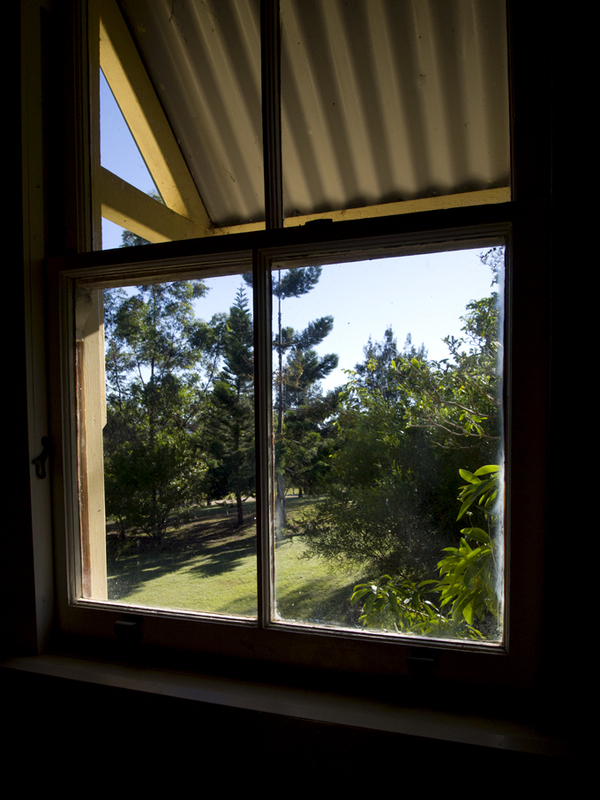 On Saturday we blacked-out a store room of about 3 x 3 metres square in the rear of the Boolamoola Homestead using plastic and curtain material in readiness for the big WPPD on Sunday. 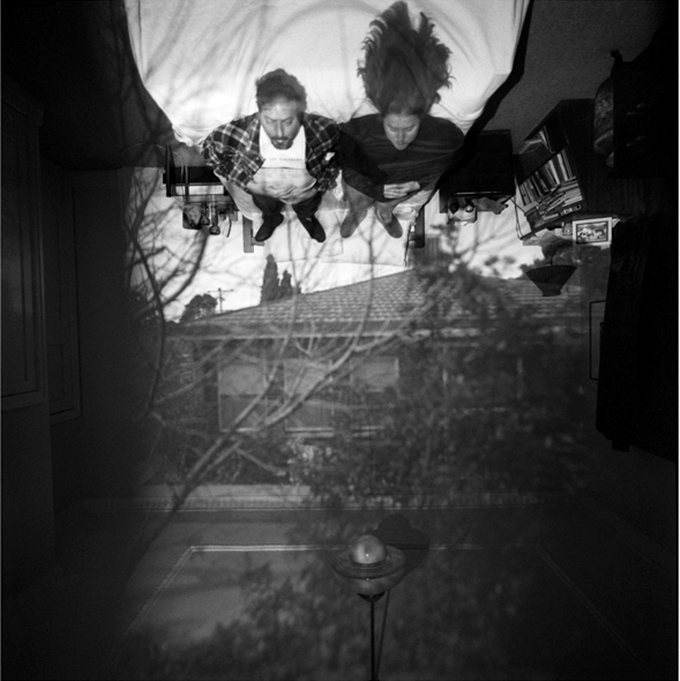 While the others sat outside eating lunch on Sunday (World Pinhole Photography Day) we sneaked into the Camera Obscura and made our image of our lunch time. 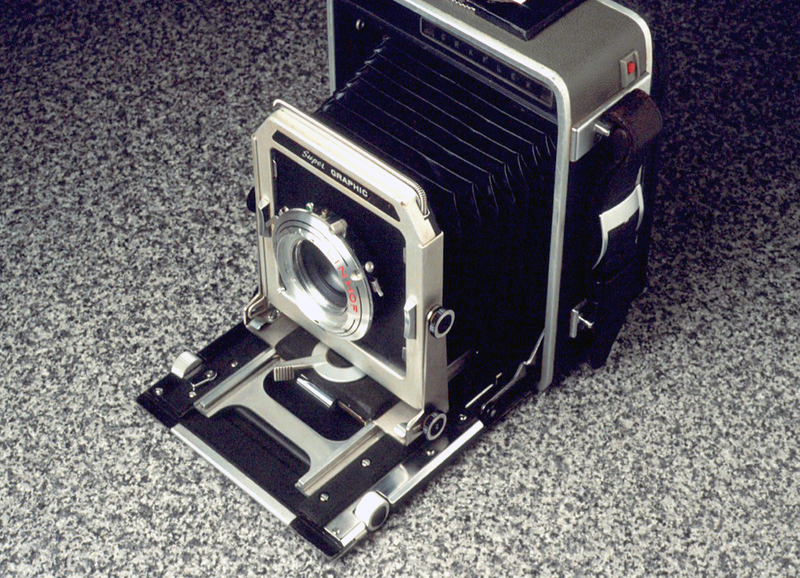 The ‘pinhole’ was around 8mm. 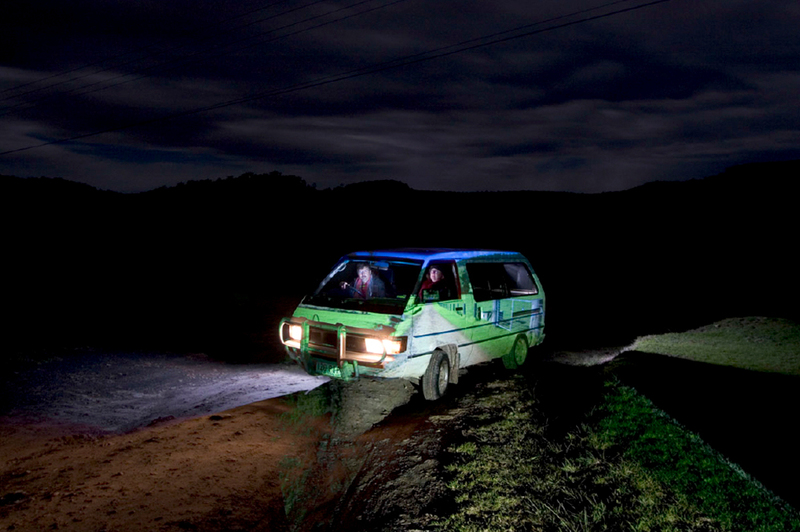 Exposure of the image was by lensed (focal length=16mm) DSLR using f8 200 ISO and time exposure of 30 seconds. 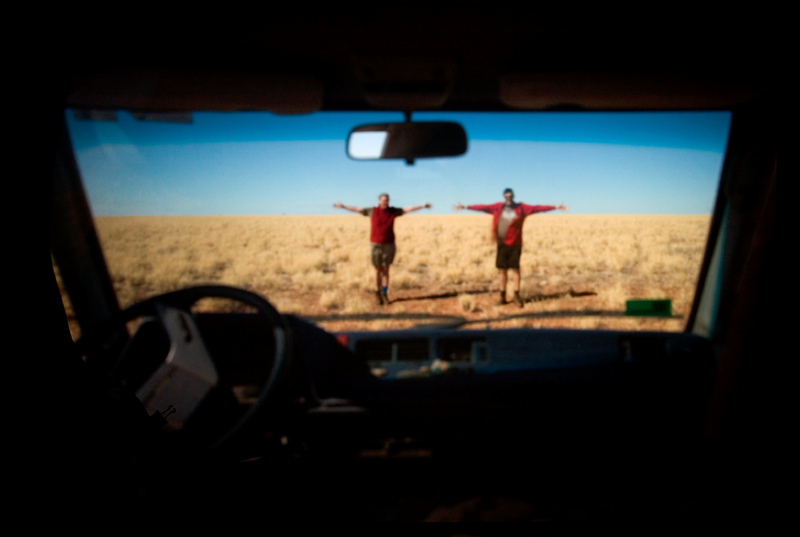 All photographs and texts © of the authors 2013. 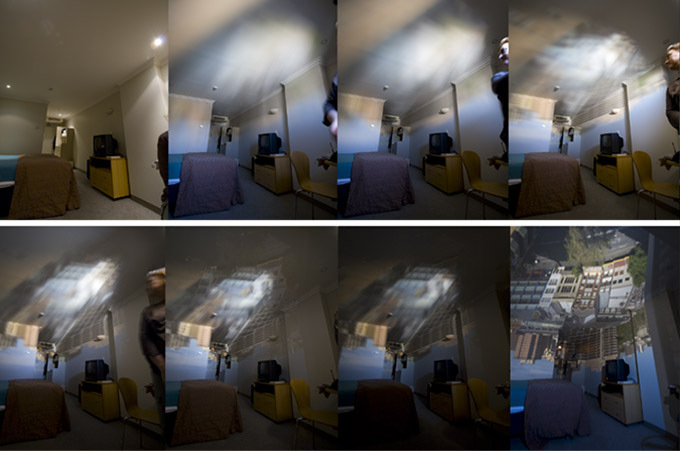 Since the year 2000 we have been making large-scale room camera obscuras. 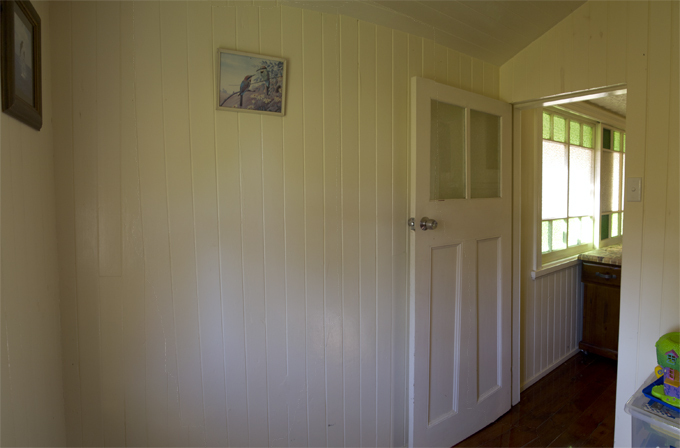 These have been made as part of visual research for our Place Projects. 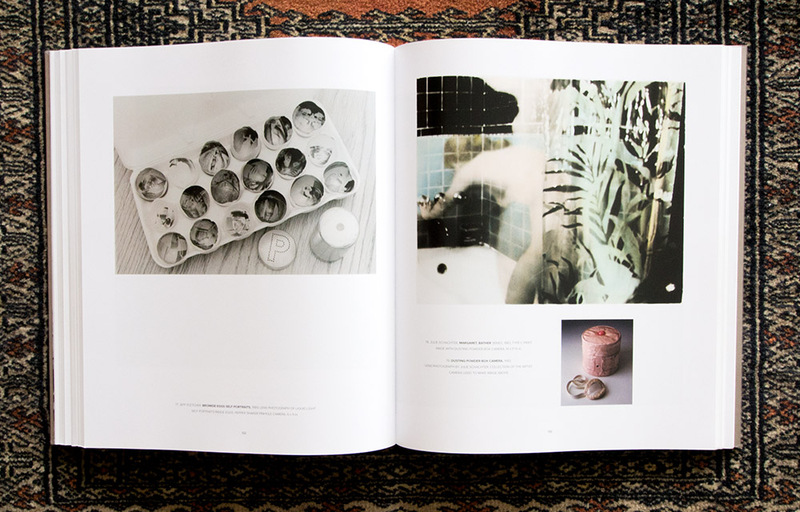 Usually we document the process and the images form a narrative for inclusion in photobooks and exhibitions. 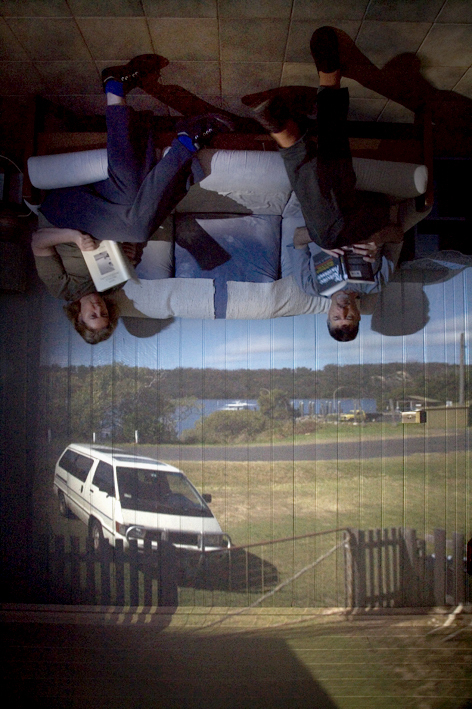 In 2009 we launched WINDOW/s, a limited edition photobook of 9 copies, along with an exhibition of the 9 camera obscura images @ the Queensland Centre for Photography. 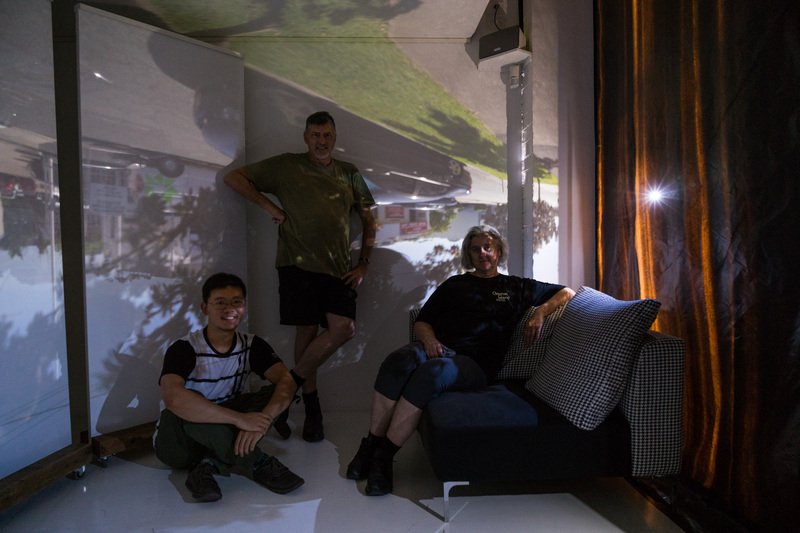 In our Place Project work we have found that the camera obscura connects us directly with the place or site that we are working in. 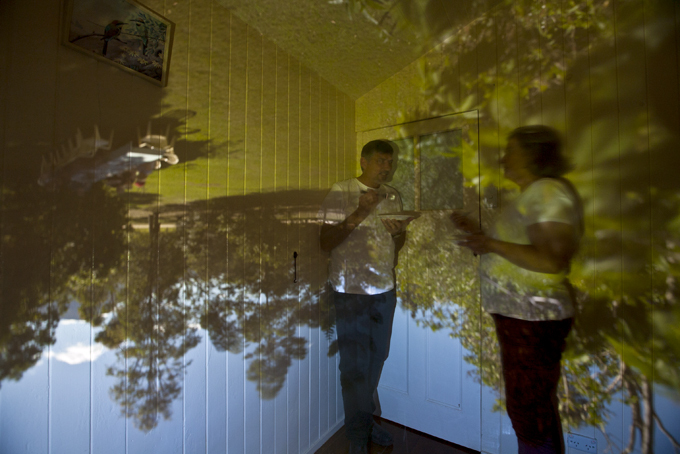 We have found that anyone witnessing the place-specific camera obscura responds enthusiastically this natural phenomenon. 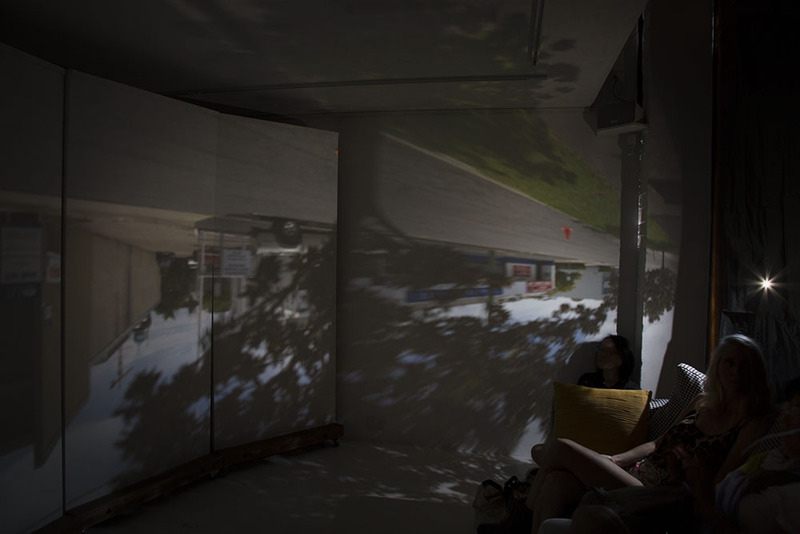 Time spent inside the camera obscura evokes a sharing of different perceptions: of the visual, of memory and of experiences in the lives of each visitor. 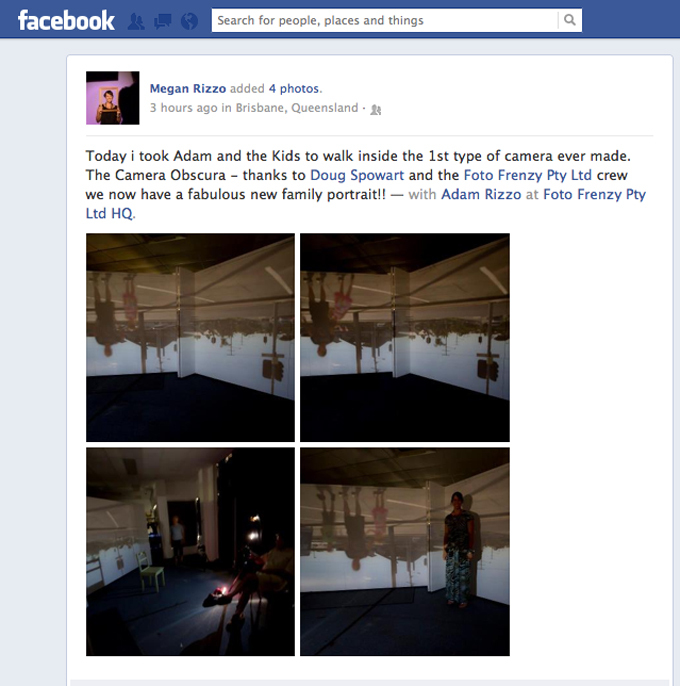 So we decided that we should create a camera obscura as part of our Foto Frenzy artist in residence. 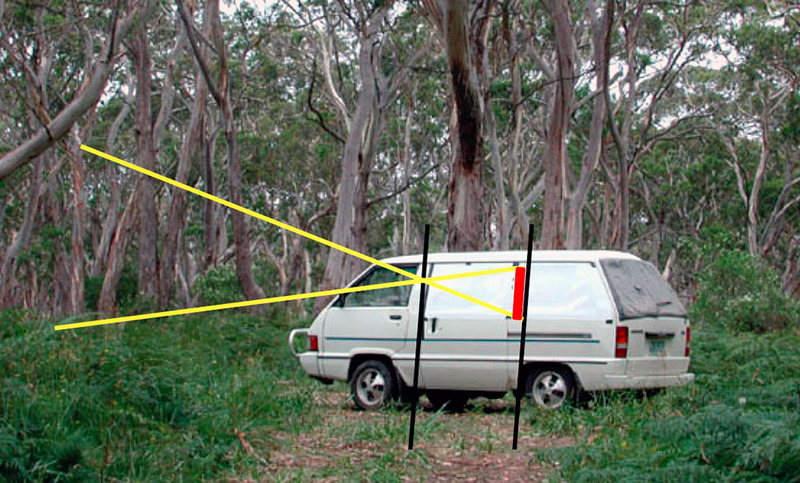 As a result of a conversation with a past QCA student of Doug’s from the 1980s, photographer John Pryke, through some great research on the internet, found that not far down the road was the site of an historical camera obscura on Whites Hill. 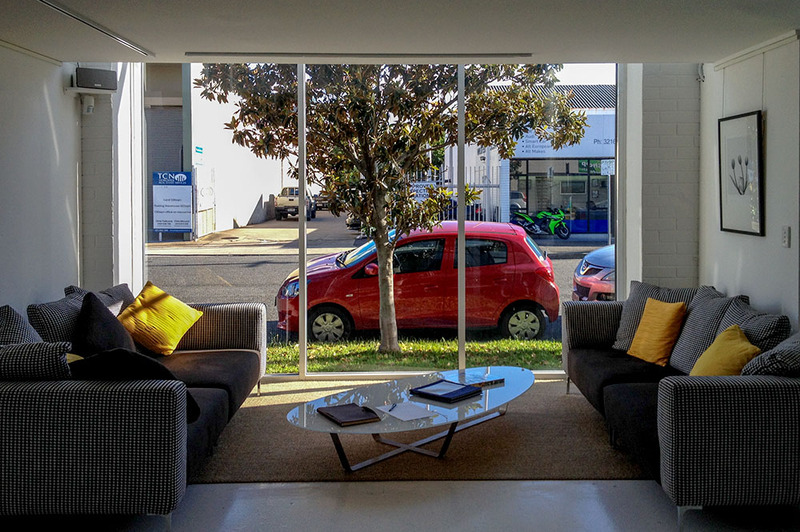 The view from the front entry of Foto Frenzy was selected as its outlook is of the defining feature of this place – the major intersection of Bennetts and Old Cleveland Roads Coorparoo. 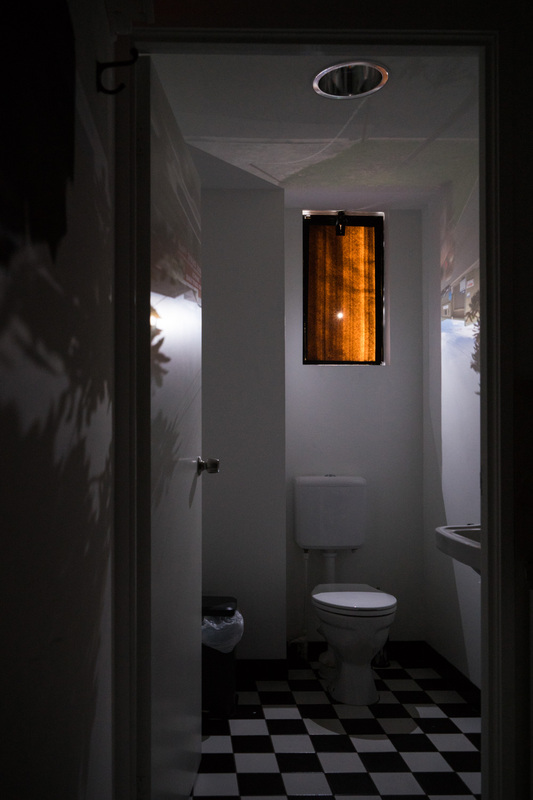 A plan was created, the room blacked out with thick black agricultural plastic, a light admitting hole of around 12 mm was made and fitted in the door of the building, and screens arranged inside onto which the image could be projected. Saturday the 20th of April was a bright sunny day with occasional clouds and the 40 or so visitors witnessed the wonders of this simple device. Many brought cameras with them to make images, some brought family members including children – all, as we hoped, were taken by the visual experience of being ‘IN’ a camera, one which did not even require a lens. 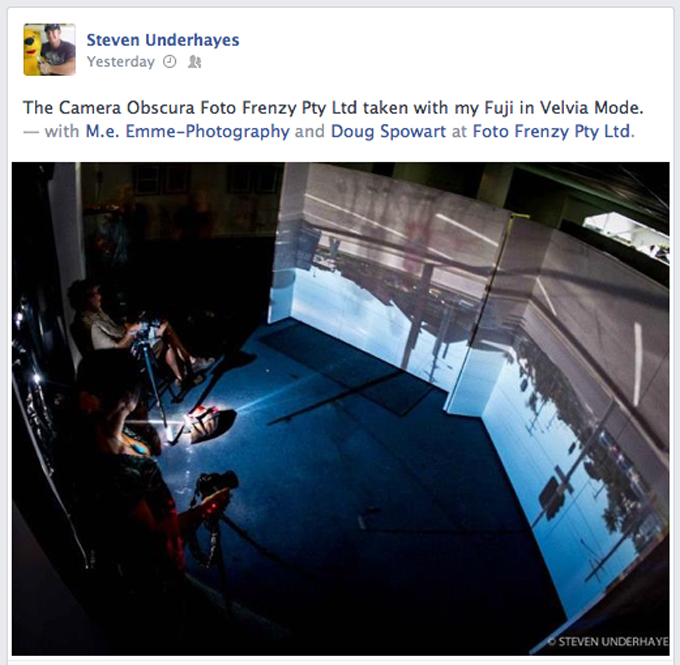 As artists in residence working with the Foto Frenzy / Brisbane Camera Hire Team, we were around some amazing technology and people with special knowledge. 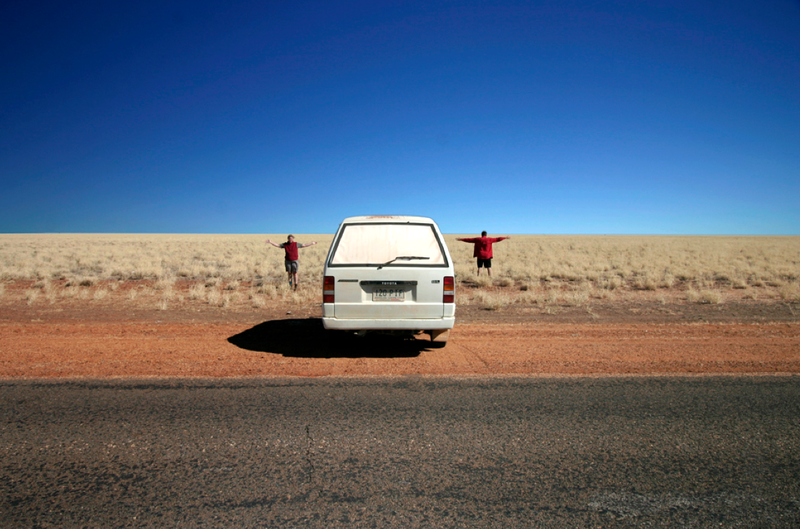 Director Darren Jew produced his Canon EOS 1D and a high speed 12mm lens for the cover image of this post. 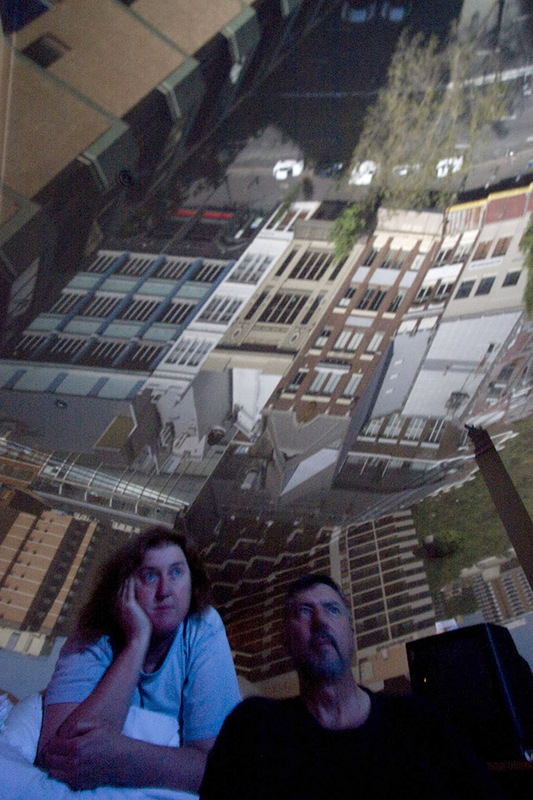 If you’ve not been in a ‘lensless’ camera obscura you will not be aware of how dark the images is – usually it takes several minutes for your eyes to adjust to see what is going on, it is that dark. 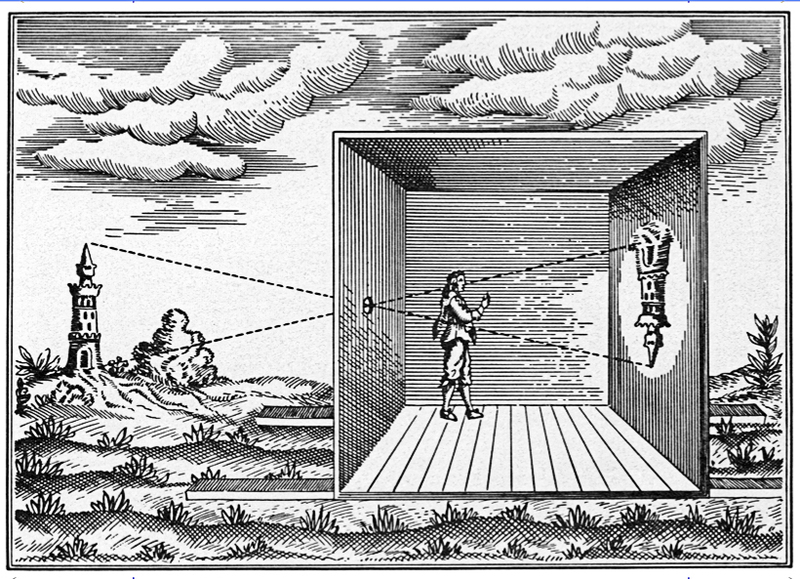 There are perhaps only a few movies of camera obscura images that have ever been made as it requires specialized cameras and equipment. Darren Jew offered to wind up the ISO of his latest camera and at 40,000 ISO we were able to create a movie of the impromptu performance of our antics outside the building as – ‘Vicky and Doug do a Selfie’. SEE the movie here …. 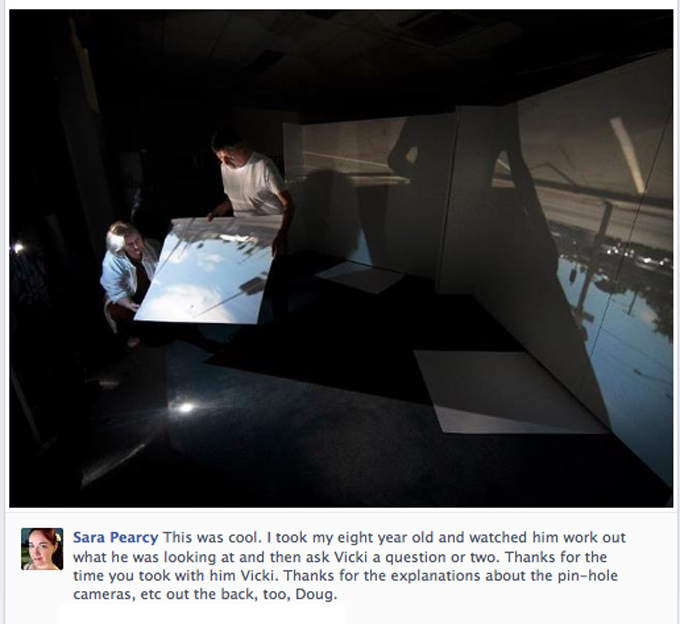 SEE more of John’s photographs on his blog: <http://johnprykephoto.blogspot.com.au/2013/04/camera-obscura.html>..
.Additionally the event included a presentation of some of our pinhole cameras, pinhole making techniques, and discussions about how to make pinhole images with SLR and DSLR cameras. Most importantly we encouraged participants to make and enter photos made on April 28 in the 2013 World Pinhole Photography Day event. 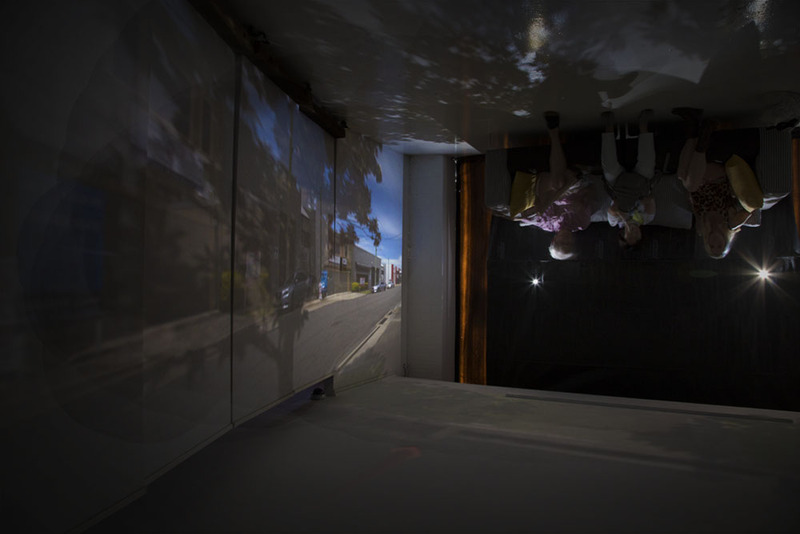 On this day the photographers Cooper+Spowart will create a camera obscura in the foyer of Gallery Frenzy for visitors to view and make photographs in. 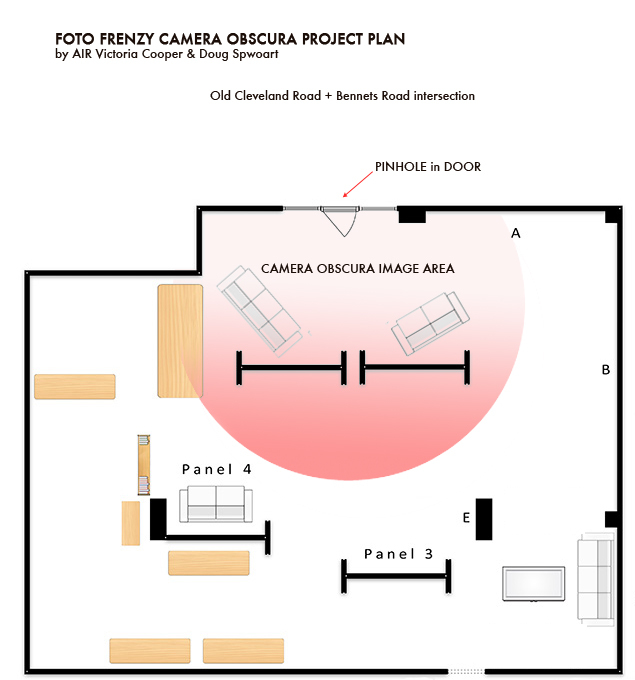 Additionally attendees will be advised on how to convert Digi and Film cameras into pinhole devices to participate in World Pinhole Photography Day on 28 April, 2013. 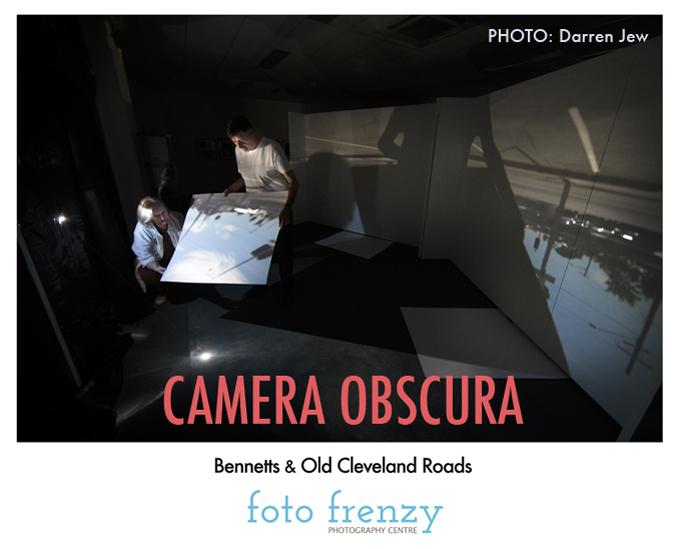 The foyer of Foto Frenzy will be blacked out – a pinhole will be placed in the window facing Bennetts Road. 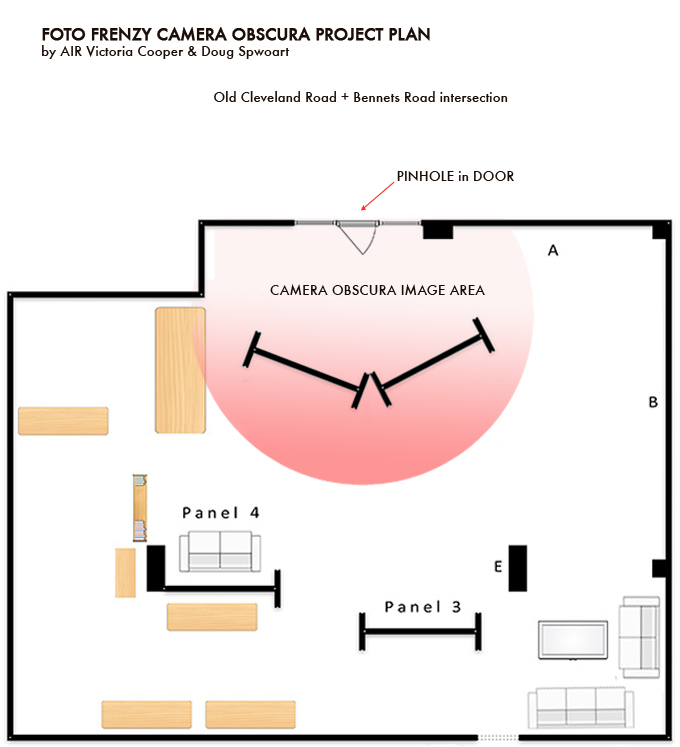 Screens will be set up inside the gallery area to image the light from outside. 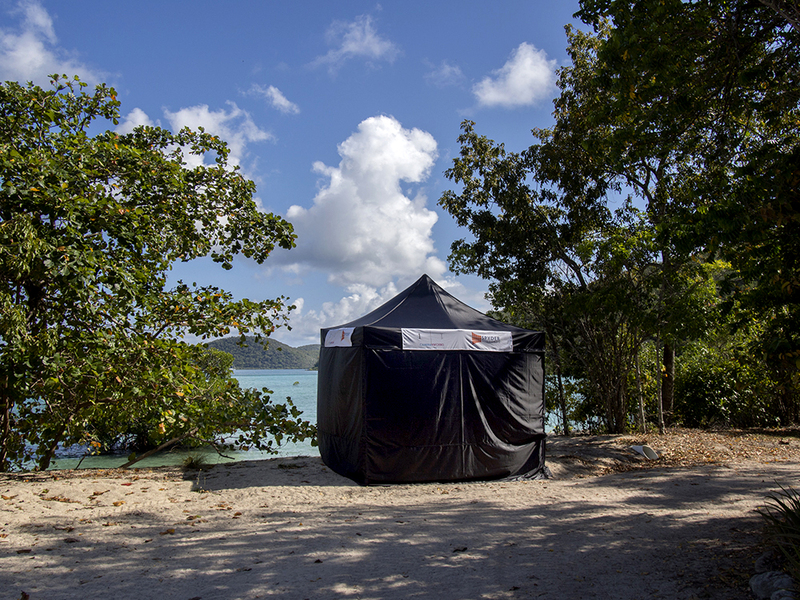 The camera obscura will be available for viewing from 12 Noon until 4.00pm and we are hoping for a sunny day as that will yield the most visible best results. 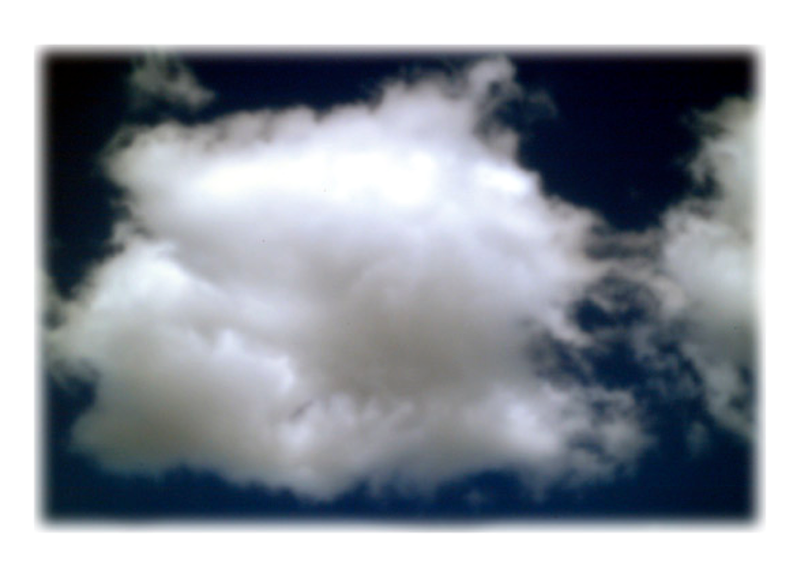 At 1.00, 2.00 and 3.00pm Vicky and Doug will demonstrate how to convert your Digi or Film SLR into a pinhole camera. Bring a plastic body cover if you have one, it may be able to be drilled for pinhole insertion. 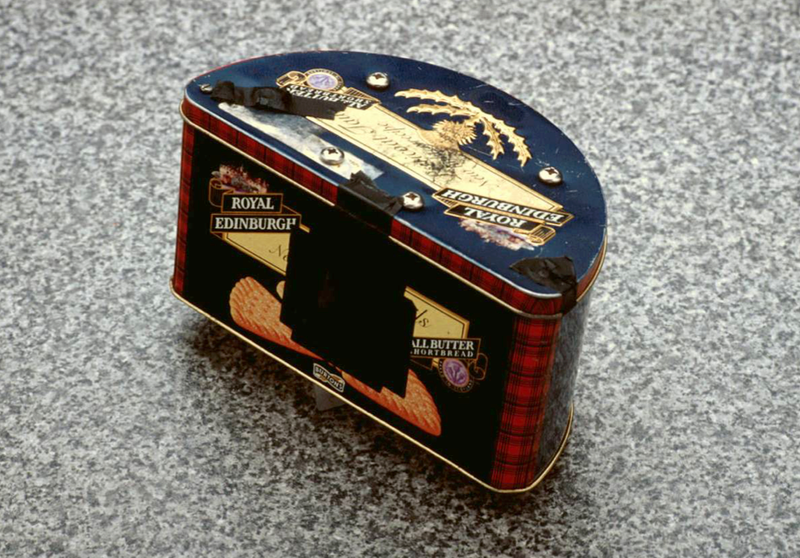 Materials will be available for you to make your own pinhole. 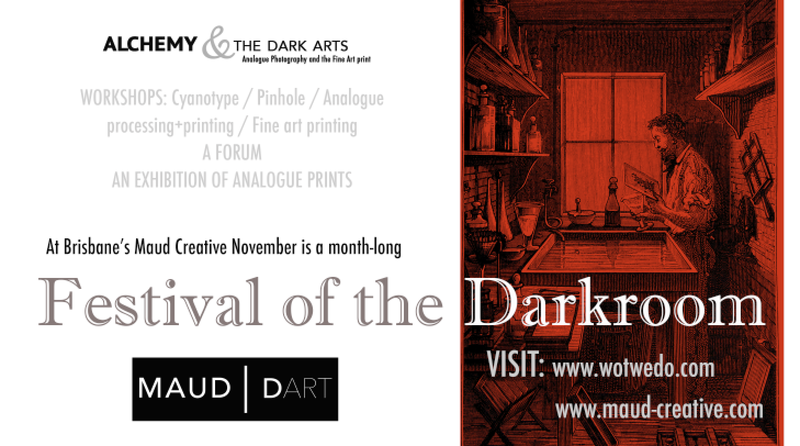 And at 1.30, 2.30 and 3.30pm Darren will demonstrate wet darkroom pinhole camera shooting (with a simple box & paper) and print processing in the NEW Foto Frenzy darkroom. 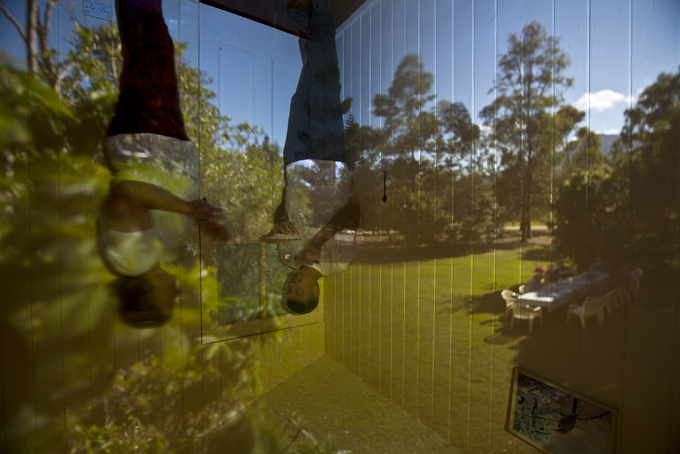 Instructions for preparing and uploading pinhole photos to the World Pinhole Photography Day site will be available.